An urgent examination into the revived Klan of the 1920s becomes “required reading” for our time (New York Times Book Review). 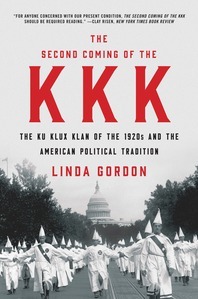 Extraordinary national acclaim accompanied the publication of award-winning historian Linda Gordon’s disturbing and markedly timely history of the reassembled Ku Klux Klan of the 1920s. Dramatically challenging our preconceptions of the hooded Klansmen responsible for establishing a Jim Crow racial hierarchy in the 1870s South, this “second Klan” spread in states principally above the Mason-Dixon line by courting xenophobic fears surrounding the flood of immigrant “hordes” landing on American shores. “Part cautionary tale, part expose” (Washington Post), The Second Coming of the KKK “illuminates the surprising scope of the movement” (The New Yorker); the Klan attracted four-to-six-million members through secret rituals, manufactured news stories, and mass “Klonvocations” prior to its collapse in 1926—but not before its potent ideology of intolerance became part and parcel of the American tradition. A “must-read” (Salon) for anyone looking to understand the current moment, The Second Coming of the KKK offers “chilling comparisons to the present day” (New York Review of Books).